The founder of the Yungdrung Bon religious tradition, Lord Tönpa Shenrap Miwoche, was born into human form as a prince in the ancient land of Olmo Lungring within the ancient country of Tazik in the Wood Mouse year of 16,017 BC*. Having taught the Yungdrung Bön to numerous disciples within Tazik, the teachings were eventually translated into three hundred sixty languages. It is said that one hundred ninety-four of these languages pertained to realms beyond the borders of Olmo Lungring. 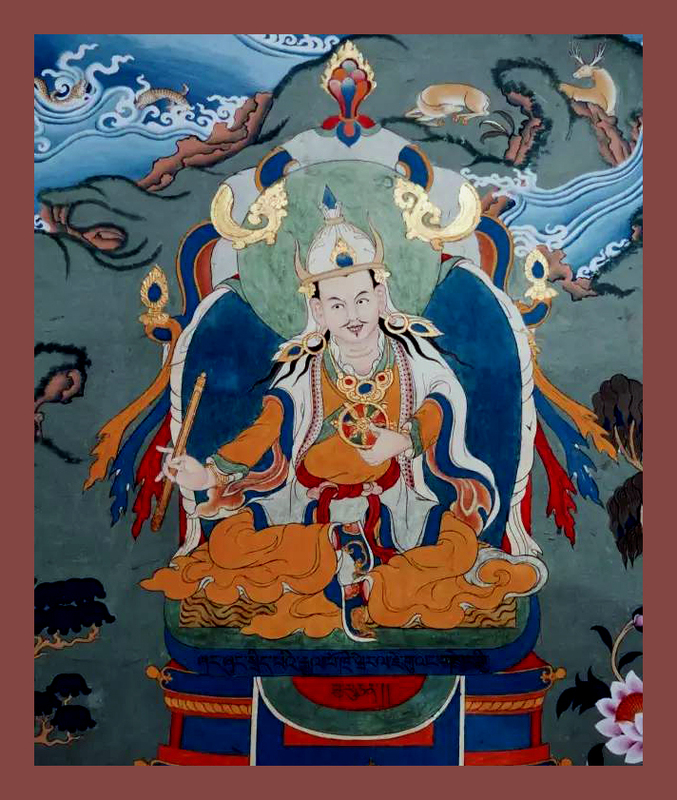 Although Lord Tönpa Shenrap Miwoche made one journey into Tibet and taught the offering of torma as a substitute for harming living beings, the Yungdrung Bön teachings were not widespread at that time. And so, having been translated and entrusted to various knowledge holders, the teachings were spread first into Zhang Zhung before spreading to India and China, and on into countries such as Kashmir, Nepal, Togar, Gilgit, Phrom, Zahor and Sumpa. From Zhang Zhung, India and China, the teachings spread into the realm of Tibet. Because of this, many of the Yungdrung Bön texts today retain some of the original Zhang Zhung words, as well as words of other languages, which predate their translation into the Tibetan language. 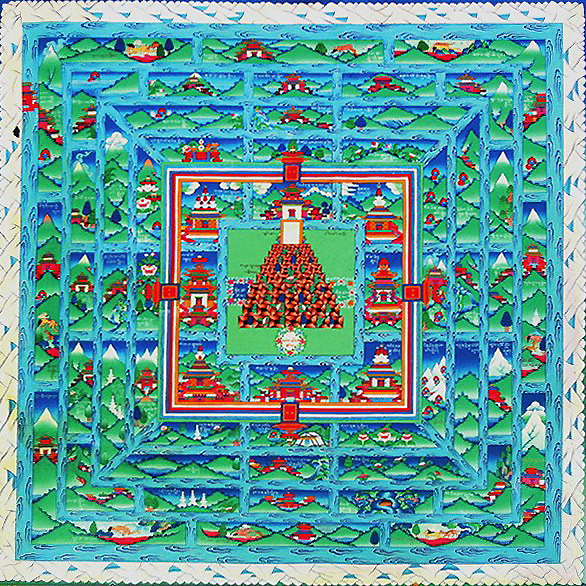 During the reign of the first seven kings of Tibet, the teachings of Lord Tönpa Shenrap Miwoche flourished and each of these Tibetan kings had one or more Royal Bön Shen, or personal Yungdrung Bön priests, who acted as a kind of spiritual bodyguard to the king by protecting his lifespan, power and wealth as well as giving spiritual guidance. Yumbu Lhakhang in the Yarlung Valley. 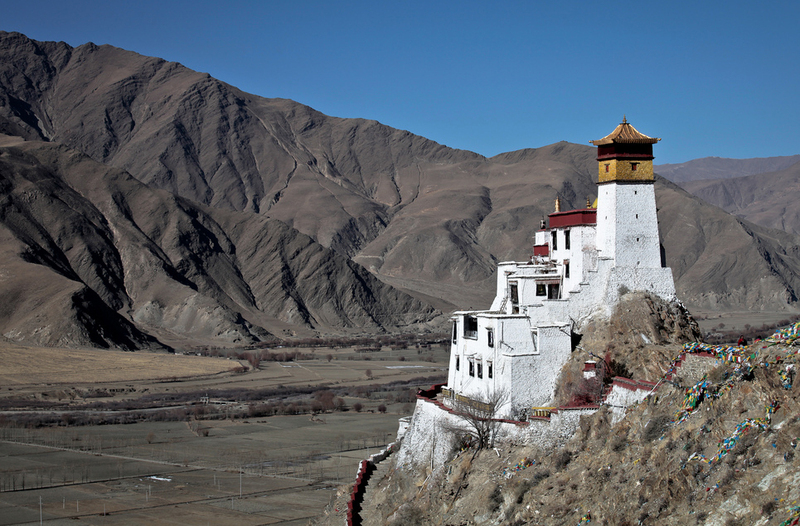 Palace of the 1st Tibetan king, Nyatri Tsenpo, and used for centuries by his successors. The first person appointed to rule as king over the entirety of Tibet, Nyatri Tsenpo, is said to have been of a supernatural lineage and was anointed king in the Wood Mouse year of 1136 BC. During his reign, the Twelve Kinds of Knowledge of the Causal Vehicles of the Yungdrung Bön doctrine were widely spread and practiced. His son, Mutri Tsenpo, invited one hundred eight Zhang Zhung scholars to Tibet and established forty-five centers for Yungdrung Bön practice and study. During the reign of the next five Tibetan kings, the Yungdrung Bön had royal support and flourished. King Tride Yakpo had a son by the name of Drigum Tsenpo who was enthroned at the age of thirteen. The Royal Bön Shen continued to be very powerful and influential in the royal court due to their deep connections with the kings of the Zhang Zhung empire. King Drigum Tsenpo’s ministers began telling him that the words of the Bön Shen were more powerful than that of the king and that they posed a great and immediate threat. Although he had practiced Bön in his youth, King Drigum Tsenpo called the Bön Shen together and told them that there was not enough room for both his authority and theirs in Tibet. Therefore, he ordered them into exile. With the exception of specific causal vehicle practices which were used to protect the king’s power and wealth, Drigum Tsenpo began the suppression and persecution of all of Lord Tönpa Shenrap’s teachings. This was 683 AD, the first persecution of Yungdrung Bön which resulted in the hiding of texts as terma, or hidden treasure. The Bön Shen loaded their texts upon domestic animals and traveled to the borderland of Zhang Zhung where they held a conference. It was decided that in order to preserve the teachings, they would divide the texts among them. Some of them traveled to the borderlands or other countries in order to spread the teachings. Others hid the precious scriptures of the Yungdrung Bön and performed prayers of aspiration that the teachings would reemerge in a more favorable time and that the teachings of Lord Tönpa Shenrap would again spread for the benefit of sentient beings. Posted on October 1, 2016, in Tibetan Culture & History, Uncategorized, Zhang Zhung. Bookmark the permalink. 1 Comment.